It burns faster and hotter, from tongue to tailpipe. It pains me to make a BBQ Sauce so stupidly hot that even I can't eat and that you shouldn't. 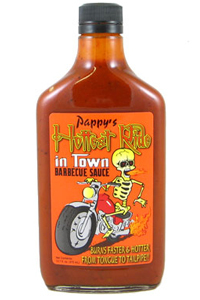 Pappy's BBQ has done it again with a high quality BBQ sauce with a bunch of freaking heat!!! Holy toledo this BBQ sauce is spicy!!! Was really surprised at both the flavor and heat of this BBQ Sauce. They aren't kidding when they say it's hot. Had it on Smoked Ribs the first time and made them even better. If you want heat and flavor this is the stuff to get. Great on everything. Its hot! Hot enough to make the average hot sauce aficionado tear up. Flavor leans more towards BBQ sauce than most others with a good mix. Which makes it good on lots of sandwiches.